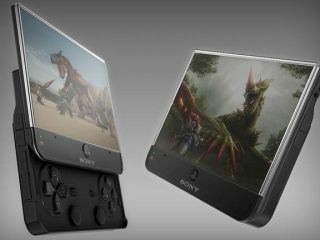 Is this what the PSP 2 will actually look like? SCEA has confirmed that the critically acclaimed PSP game Patapon 2 will not be released on its proprietary UMD-disc format in the US, instead being released as a digital download only. Gamers who wish to buy Patapon 2 at retail will purchase a box which contains a download code. "We're considering a digital-only format for the Patapon 2 release as a one time test case as we continue to explore consumer preferences for digital content," SCEA PR man Patrick Seybold said in a statement. "The downloadable game will be available on May 5th at both retail and via the PlayStation Store. We remain focused on providing superior games and entertainment experiences in both the UMD and digital formats and are working closely with our partners to deliver the best PSP line up in our history." PSP 2 to ditch discs? The news will no doubt spark further speculation in the games industry that UMD's days are indeed numbered. "Sony may be inching even closer to a purely digital business model, but retailers will surely want to fight the future," notes Ars Technica. "Is this the first shot in the digital war?" While the rumours that the next PSP is set to be a disc-free download only machine have been doing the rounds for sometime, 1-Up adds that "it's still a bit surprising to hear that Sony will entirely abandon the disastrous format in favor of downloads for even a single game." "It's unclear if we have all the details clear at this point, but it looks like retailers are going to have a headache on their hands when consumers start questioning employees about why there isn't a game in the box they've just picked up. I can't wait for those stories to surface."